Stepping off the plane at Heathrow and then navigating the sprawling city can be quite daunting to a weary traveller or newbie. Worry not: There are a number of iOS apps which will not only help you navigate London like a resident, but also ensure you have a good time on vacation. London is an expansive city, and the best way to get around it conveniently is to use the London Underground. Typically, there are multiple tube lines depending on the location and direction in which you are travelling. It’s pretty easy to get lost if you don’t pay attention to the various maps outlining the city's 14 different routes. This is where London Tube Deluxe, an iPhone and iPad app from Malcolm Barclay really shines. Not only does app provide you with a map and the status of each line, it also lets you plan a journey, listing times and where you might need to swap lines. You can also search individual maps, check departure boards, and save your favorite journeys and destinations—pretty useful if you’re trying to get back to your hotel each night. The app can also use your location to find the nearest station if you’re lost. While London Tube Deluxe is generally easy to use due to a simplistic user interface and each tab clearly stating what it’s for, individual line maps could use a little work. Despite being searchable, if you were hoping to count the stops in between entering and leaving the Tube, the map doesn’t fit on the screen in an easily readable way. Expect to do a lot of pinching and zooming. Its content is largely adapted from Wikipedia, but London2G’s detailed information pages are accessible when you’re offline. London also provides a wide variety of historical landmarks and museums for you to visit. If you enjoy reading up on all the tourist attractions or just like being prepared, Ulmon’s London 2Go will prove somewhat useful. The iPhone and iPad app is essentially an offline guide to all the places of interest within the city. You can either search for an attraction or recommended place, or pick from one of the categories on the home screen. 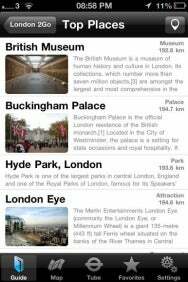 London 2Go then provides a detailed information page about the attraction, complete with images, nearby public transport, and links to other interesting pages. 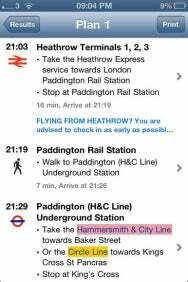 While London2Go can provide you with encyclopedic knowledge of London to impress your traveling companions, the app basically pulls relevant information regarding the city from Wikipedia. Essentially, you are paying for an offline version of the website, should you find yourself without any Internet access. The biggest benefit of London 2Go is its offline map: Not only can you brush up on your London knowledge, but you can find points of interest quickly. The app will also locate you on the map, so you can see how far away you are from a destination. However, the map itself is quite complicated and could be a lot to take in for a first-time visitor on the move. The messy map can be forgiven, though, with the inclusion of an impressive London Underground map, also capable of finding the nearest station to your location. Come for the knowledge with this app—but stay for the interesting tube map. London Transport gives you plenty of journey planning options for finding your way around the city. While the London Underground is a great way of getting around, there is a possibility that the line you want to take is undergoing some service disruptions. Fortunately, not only do Underground tickets permit you to travel above ground, but there are usually plenty of options to get around. London Transport from Jeevan Takhar is a hub of information if you don’t necessarily want to use the Tube. On launching the app, the first things you’ll notice are the options to plan a journey, return to where you’re staying or simply book a nearby cab. “Plan a journey” has all the important city spots you may be getting to and from, and the various results are clear, easy to follow and in time order. Not keen on walking much between stops? You can filter out results involving a lot of walking, or, if you don’t feel the need to switch modes of transport, you can select from a list of options how you’d prefer to travel—even bicycle rental is an option. If you do some extra tapping around, you’ll also be able to roughly calculate fares for your journey. All of this data can save you a lot of headaches in the event of a delay, but London Transport could do with the addition of real-time disruption status messages across more transport modes to avoid further travel interruption. Olympic visitors will appreciate the venue information in 2012 Summer Games London Offline. If you’re visiting London specifically for the Olympics, then an Olympic-themed app is a must. 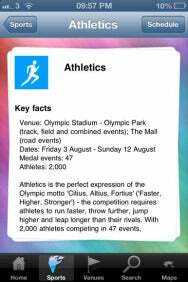 2012 Summer Games London Offline is a helpful app that won’t bust your budget. The iPhone and iPad app from Tidels opens with a countdown to the Olympics. From here, you can use the app to learn about a variety of different sports and find out where and when they are happening and as well as how many athletes are taking part. Additionally, you can study up on the different venues, including the new Olympic Stadium. It’s worth noting that while not unusable, 2012 Summer Games London Offline does have its issues. It can be a little slow to react when you’re tapping around. 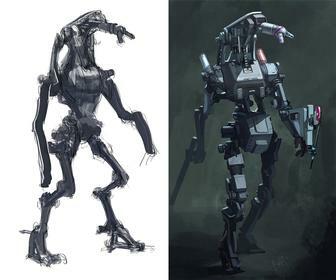 On occasion, it also struggles to change from one orientation to the other, but this doesn’t appear to happen every time it’s opened. Unfortunately, on closer inspection, menu icons are not optimized for a Retina display either, looking quite pixelated. However, the app is saved by its search function—although this should really be called Schedules. This feature allows you to search through all the Olympic and Paralympic sports, venues, and dates to find out what is happening—great if you need to find out where you have to be for the sport you’re cheering on. Better still, the entire app works offline, so it’s worth having if you can overlook the problems. 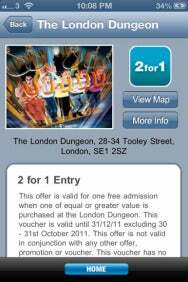 The deals on London Vouchers can help you save a pound or two when enjoying London’s many attractions. Just because you’re on vacation, it doesn’t mean you can’t enjoy saving a pound or two. London Vouchers is an app that tracks down all the latest deals around the UK capital, helping you make great savings or even bag a freebie. The grid-like design of Apps Avenue’s iPhone app may not make it the most attractive app out there, but it is certainly functional. The app is ideal for tourists and residents alike, with some vouchers catering to those living in London, but many are suited to the money-savvy vacationer too. Choose from attractions, entertainment, tours, dining, and other options to find a deal. Narrow down the results further by choosing a particular area of London (or nearby), and you will be presented with places offering deals as well as the instructions on how to claim them. It’s as simple as that. The only problem with the app is that it doesn’t pull the vouchers offline, so you’ll need to either jot down or take screenshots of codes before leaving or track down Wi-Fi while you’re away. Like with 2012 Summer Games London Offline app, icons may appear pixelated on high-resolution displays too. If you like bargains, however, these complaints shouldn’t stop you from a download. Orange highlights make it easy to spot recommended sights in Fodor’s London Travel Guide. If you are looking for a convenient way to carry a guidebook around, Fodor’s London Travel Guide is exactly what you are looking for. 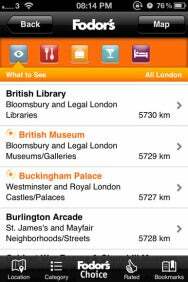 This useful app from Random House Digital hands out all the information a traveller might need to make the most of their time in London. The home screen greets you with a variety of different recommendations, without feeling like you’re being bombarded. You can see nearby points of interest or read up on different attractions. Most important, you can see reviews of different places. To help you visualize distances, each place is clearly marked on a map; maps in Fodor’s London Travel Guide can also be used offline. Each category will search all of London to find the best-rated spots though, so make sure you filter results by type, rating, or price. Any place highly recommended by Fodor’s appears highlighted in orange, helping you make quicker, informed decisions. 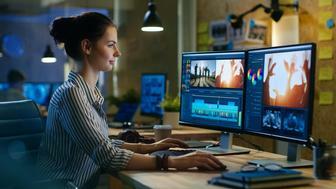 Aside from icons being a touch on the small side—making it less obvious how to refine results or switch between tabs—loading data can be quite slow. Due to the sheer amount of places to see (or taste) in the capital, this is somewhat understandable. Not bad at all, for a free app. The London edition of Smart Maps is ideal if you’re looking for a few specific areas to go in the city. Why battle with oversized paper maps in the middle of busy streets when you can just check your phone? Smart Maps—London is a very basic app, and acts a little like an extension to the Maps app built into iOS devices. There are just two options in this iPhone and iPad app from Alexandru Halmagean—a general map of London with Underground transport markers, or a city guide. The city guide will help you find a variety of different amenities, including individual fashion shops, malls, and places for worship or accommodation. Like a Google Maps search, a pin will drop on the general map; within that area, you'll find your chosen place. If you are likely to return, you can easily bookmark places, too. This app is ideal if you are only looking for a couple of places to go within the city, preferring to leave the rest to discovery. However, the search is limited: You can’t get directions, or look at more than one place on a map. Sadly, the compass feature can also be a little temperamental. While you could stick with the Maps app already on iOS, it could be argued Smart Maps will at least help you discover new places or sights without needing to find them on the Web first.